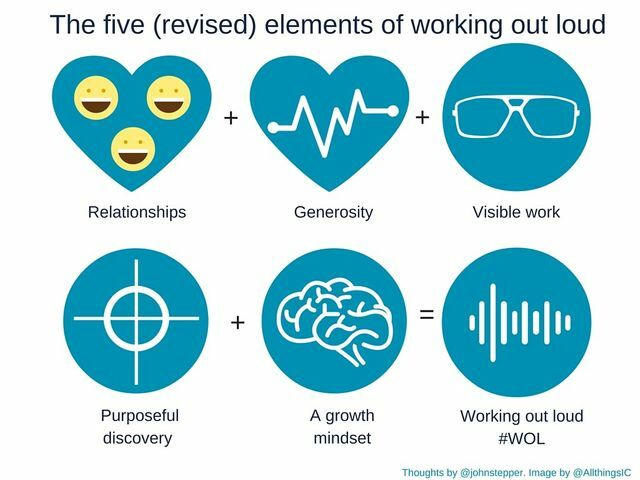 Great post below from a popular UK commentator on communications, Rachel Miller, on the notion of 'working out loud,' a concept sparked by Bryce Williams of Eli Lilly a few years ago. Client executives often ask us whether they should be active on social media. The answer, yes - but only if you mean it. If you believe you can do more with the input of others - even others not in your formal organisation - and you're willing to contribute something to help others achieve their objectives, yes - it's probably a good idea. If not, well, no. Not yet. In school we were taught to shield our work and keep our thinking to ourselves. In the workplace we are encouraged to collaborate and communicate with peers.This mindset shift has been expanded on by a practice called Working Out Loud.